Sometimes a love of music, good times and getting a little muddy is reason enough for putting on a music concert of festival. But sometimes there’s a bigger cause behind the music. Earlier this month, American television network ABC and the Red Cross partnered together to put on the Hurricane Sandy Relief concert, which was a collective aid response to the devastating hurricane that hit the east coast of the United States (among other places) earlier this month. Hurricane Sandy caused substantial damage in areas of New York and New Jersey. Hundreds of thousands of residents were forced to evacuate Manhattan before the great storm even arrived, and while those efforts inarguably saved countless lives, they weren’t enough to curb huge amounts of damage done to the city. Many people’s homes were destroyed or severely damaged. Over in New Jersey, entire sections of the boardwalk and shore were washed away in the storm. Many victims of Sandy were left without electricity, internet, heat or worse. Many lower Manhattan residents returned to destroyed homes that won’t be fixed until as late as February. Once a main tourist attraction and the subject of many reviews from groups like the Resort Members Association, New York City was practically brought to its knees. With mass transit slow to return and many people in dire need of aid, ABC and the Red Cross decided to put on the benefit concert to help in the aid donation gathering. Televised live for a commercial-less hour on ABC, the concert featured such major headlining acts as Bruce Springstee and Bon Jovi, both of whom are from New Jersey and have made the Garden State a major theme in many of their songs. Other big performers included Steven Tyler, Billy Joel and Mary J. Blige. Famous actors like Danny Devito, Jimmy Fallon, Tiny Fey and John Stewart were also on hand. The concert is said to have raised over $23 million, which the Red Cross is using to provide shelter, food and emotional support to as many of those in need as possible. 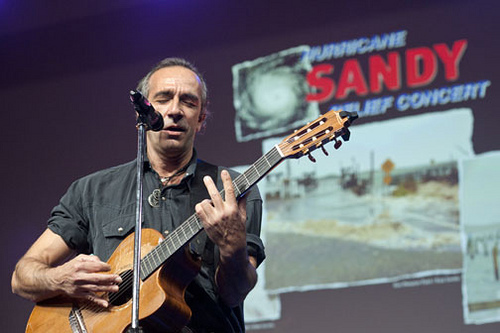 None of the performers who were part of the Hurricane Sandy Relief Concert were paid for performing or being present. All who came did so out of their love of the areas effected or merely out of a desire to help those in need. New York City residents in particular have been cited as being aggressively dedicated to providing relief for those in need. All over the city in the immediate aftermath of the storm, residents who had retained power and/or heat hung signs outside their doors or windows offering outlets, heat or just a hug to anyone in need. The New York City marathon was canceled, and many planned participants ran to the islands surrounding Manhattan instead of in a race to lend a hand in the relief efforts. Music is an incredibly powerful motivator, healer, inspiration. Sometimes it’s really nice to see how quickly and selflessly some of the world’s most recognizable musicians and entertainers are willing to come together to help out after such a terrible disaster. But even more inspiring is how quickly and selflessly some of the world’s least recognizable everyday people are willing to offer what little they have to others – even if it’s just a little music on the street.